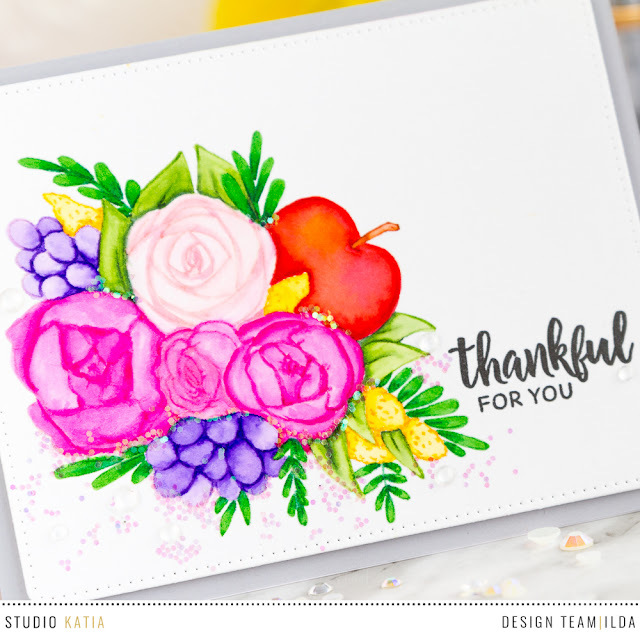 The new Studio Katia's and Simon Says Stamp STAMPtember Collaboration | Fresh Bunch Stamp and Die Set is LIVE and NOW for sale at SSS while supplies last people! Run and get it, I have a feeling this set is going to fly off the shelves!!! Here's a closer look at all the gorgeousness! To make this card I began by stamping out the image using fadeout ink onto Bristol Paper. I then used Zig Clean color Brushes to color the bouquet in. I then stamped out the sentiment off to the side and die cut the panel and popped it onto a grey card base I then finished the card by adding glitter and crystals to the card front. Hope this card has inspired you, don't forget this set is only available while supplies last!